Crowd starts to fill during a rally Saturday in support of House Bill 425, to remove the sunset on Montana's Medicaid expansion program. A competing Republican bill would also make the program permanent, however adding additional requirements. One side, supporting maintaining the Medicaid expansion Montana has now, organized a rally in the Capitol rotunda. More than a hundred people filled the floor space at the center of the building and crowded the balconies above it, chanting "Medicaid! Works! Medicaid! Works!" in support of a bill to stay the course. Enacted in 2015 with bipartisan support, Montana’s expansion accepted the federal government’s promise of a lot more funding from the Affordable Care Act if it would extend Medicaid coverage to so-called able-bodied adults. Prior to that only children, pregnant women, the elderly and people with blindness or other major disabilities were eligible for the coverage. Helena Democrat Mary Caferro is carrying the bill to keep expansion going beyond its June expiration date. “Please support the health and wellbeing and employment of nearly 100,000 Montanans. I’m begging you,” Caferro said. There was no rally for the Republican bill that would make big changes to Medicaid expansion. It’s being carried by the same lawmaker who sponsored the bill creating expansion here, Representative Ed Buttrey of Great Falls. "I do certainly acknowledge, and I cannot argue with the successes of the current program," Buttrey said. "But I also cannot deny that we can do better, that we can make the system even better." Buttrey isn’t necessarily a fan of government entitlement programs, but he says Medicaid expansion makes sense to him as an economic development tool. "As a businessman, I also saw the ongoing, desperate need of Montana businesses to find healthy, un-addicted and reliable employees. And I knew that a real solution, one that would truly make a difference would need to create a union between economic development and healthcare," Buttrey said. So Buttrey’s 2015 expansion didn’t just give tens of thousands of working age people access to steady, affordable health care that low wage employers mostly don’t offer. He added state Department of Labor support for people trying to get jobs, or better jobs, including free job training. He wanted to go further, to require people getting Medicaid to work, but the Obama administration wouldn’t approve that. But now, with Donald Trump in the White House, Representative Buttrey sees a chance to pass something a lot closer to what he wanted in 2015. "The bill is called MRIA (“Maria”), the Medicaid Reform and Integrity Act,"Buttrey said. "It looks at who is affected by the program, and assures that the State of Montana more actively works - more actively works - with anyone who chooses to improve their situation in life. It’s much more than about health care, it’s about responsibility and integrity and the ultimate success of anyone who chooses to participate." Buttrey said his bill would require about a third of the 96,000 Montanans getting expanded Medicaid benefits to work 80 hours a month, or engage in other productive activities, like going to school, volunteering, or getting into drug rehab. Rep. Ed Buttrey is carrying House Bill 658, sometimes refereed to as the Medicaid Reform and Integrity Act. But Democrats say Medicaid expansion doesn’t need reform. They say it already has a workforce incentive program that works. A state report says more than 24,000 people have gone through it, and that in its first year 71 percent of unemployed people in it got jobs. Mary Dalton is a former Montana state Medicaid director who picked apart the pages of rules in Buttery’s new bill that outline who would and wouldn’t have to work to get benefits, how the state is supposed to track that, and how people are supposed to report their employment status. "Work requirement will be an artificial barrier to health coverage that will cause people to lose coverage, not because they don’t want to work, but because it is so administratively complex to get through there, some people will throw up their hands and give up," Dalton said. A study by George Washington University says Buttrey’s bill would cause more than 50,000 Montanas to be dropped from the Medicaid expansion rolls. That would be just fine with some Republicans, who complain that the 96,000 currently enrolled ismore than twice as many as was initially predicted. But lots of people who testified Saturday said that it’s not fair that they can’t get health care benefits just because they work jobs that aren’t 40 hours a week, year-round and well-paying. While lots of people lined up to speak for or against the competing Democratic and Republican bills, a lot of the big players in Montana’s healthcare industry chose not to take sides. "The Hospital Association has adopted a position of support for both of the measures that have been before the committee this year," Bob Olsen with the Montana Hospital Association said. Ditto for the state’s biggest health insurance company, Blue Cross and Blue Shield, and hospitals as big as Benefis in Great Falls and Billings Clinic, and small as the one in Glasgow, which has 25 beds. "Our issue is making sure that we maintain reasonable access to coverage for the constituents that we serve. And we support any vehicle that keeps that access available," Randy Holom the CEO of the Glasgow clinic said. So now it’s up to lawmakers to figure out what to do with the competing bills on Medicaid expansion. If neither passes, the coverage for some 96,000 Montanans would end June 30. Every Democrat in the state House and Senate have lined up behind Representative Mary Cafero’s bill, as has Governor Steve Bullock. There’s plenty of Republican support for Buttrey’s bill, but it’s not universal, as the most conservative members of the GOP caucus want expansion to end. House Majority Leader Brad Tschida says Montana voters said as much when they defeated I-185 last fall, which would have raised tobacco taxes to pay for Medicaid expansion - tobacco companies spent record money against it. 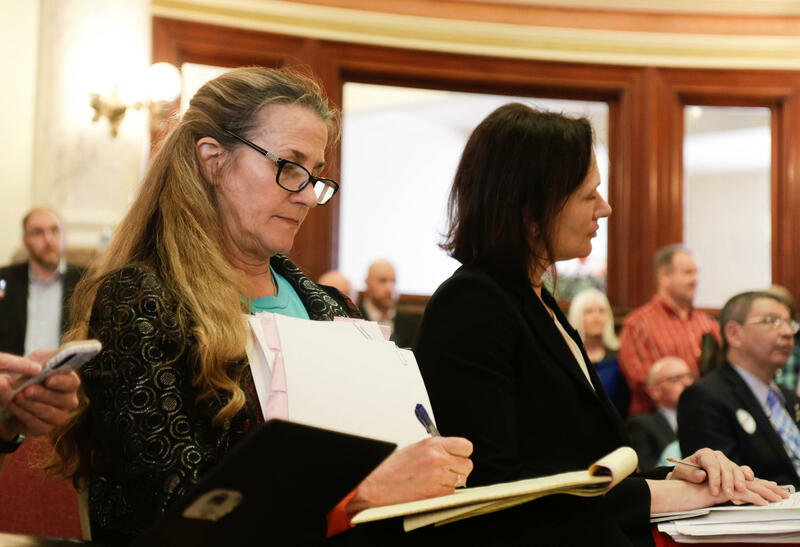 “The people who voted against this measure are tired of being of taxed, and given that they are going to be seeing an inordinate number of tax dollars spent on this program we have to be mindful of that,” Tschida said. The first legislative debates of the competing Medicaid expansion bills Saturday came relatively late, as lawmakers are scheduled to wrap up their work no later than May 1. They’re still waiting for cost estimates on Buttrey’s bill from the Governor Steve Bullock’s budget office. It says the Democratic bill would cost the state’s general fund over $49 million dollars through fiscal year 2023. Both bill sponsors say that their bills will pay for themselves through a mix of new fees on hospitals and increased tax revenue from the infusion of federal Medicaid funds. The House Human Services Committee is expected to vote on both Medicaid expansion proposals later next week. The deadline for the full House to pass an expansion bill and send it over to the Senate is April 1. The timeline after that, however, is unclear. Republicans are hinting they will build up the political pressure on Governor Steve Bullock by not sending him a bill to continue the expansion program until the final days of the session. Tonight on Capitol Talk: Medicaid politics; how Sen. Tester has moved to the center; and what's Gov. Bullock doing in Iowa again? Tune in now for these stories and more from the state Capitol, with Eric Whitney, Holly Michels and Rob Saldin.